Over the past few years I have enjoyed writing educational articles for our optometric magazines, and more recently been involved in publishing articles and material on this website – so I have some sense of the time and effort involved in writing. 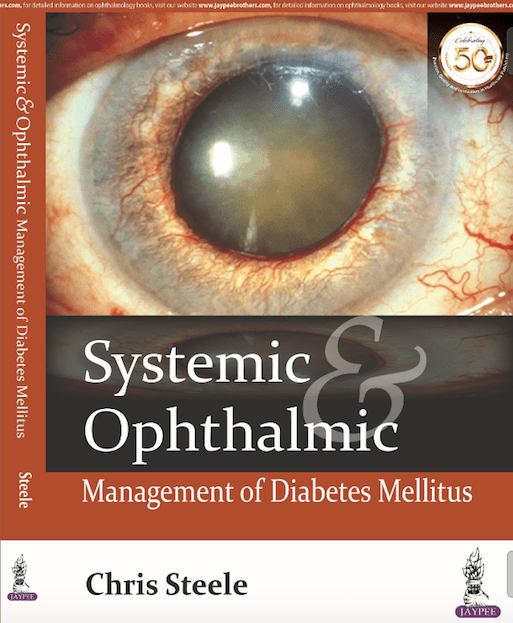 However to spend three years writing and producing a comprehensive textbook on the subject of diabetes in eye-care covering 16 chapters is quite a brilliant effort and achievement . We are aware of diabetes in our profession and the damage it can cause in the form of retinopathy as well as the wider systemic health risks for patients with this condition. The scale of this condition however continues to balloon and just becomes more staggering year on year. Chris highlights that globally diabetes claims a life every 6 seconds with almost 50% of those deaths in people under the age of 60. Another sobering statistic is that 80% of people with Diabetes will die of cardiovascular problems linked directly to this condition. 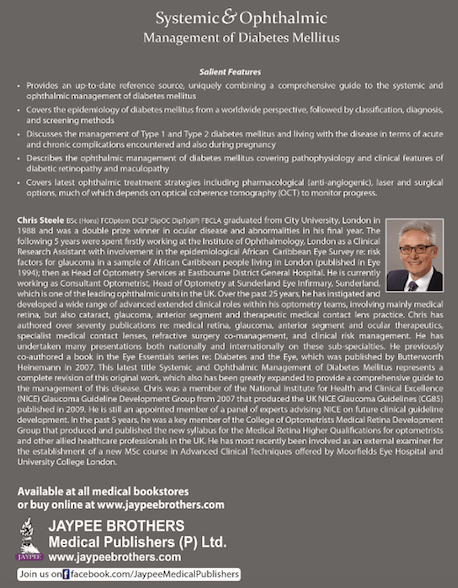 This book sets out to give clinicians a clear insight into both the systemic and ophthalmic management diabetic retinopathy as the two are so intrinsically linked. The chapters walk through all aspects of this condition including epidemiology, pathophysiology of diabetic retinopathy, screening and patient examination, and crucially how they are managed. A strong theme is the importance of good underlying control of this systemic condition as a means of reducing the risks of developing retinopathy and other complications, and also in managing these clinical complications. For any ophthalmic clinician wanting to learn about diabetes or to consolidate their knowledge and stay up to date this is an incredibly useful text book. The two forms of Diabetes Mellitus each have a dedicated chapter, which then leads on to retinopathy itself in terms of how it develops and its clinical features. From an ophthalmic clinical perspective the screening of retinopathy is covered, followed by various treatment modalities such as laser, surgery and pharmacological options. There are also chapters dedicated to preventing retinopathy through tackling the underlying systemic factors, diabetes in pregnancy and finally the role of OCT in diabetes care. This text book has been published by Jaypee Brothers Medical Publishers and is available currently in ‘e-book’ form at their website. This text is going to be useful to a range of professional groups including optometrists, ophthalmology trainees, ophthalmic nurses, GPs, retinopathy screeners and students. So a lot of hard work from Chris Steele in writing and producing this text, which will hopefully have a really positive impact on this huge health and eye-care problem. Previous Post What makes a good referral?